Aortography is an imaging procedure by which the aorta (the main artery leaving the heart) and its branches can be seen on X-ray film after injection of a contrast medium (a substance that is opaque to X-rays). Aortography is a type of arteriography. Aortography is used to detect aortic aneurysm (ballooning of the aorta) and assess the severity of peripheral arterial disease before surgery. Contrast medium is usually injected into the aorta through a fine catheter inserted either into the femoral artery at the groin, or into the brachial artery on the inside of the elbow. 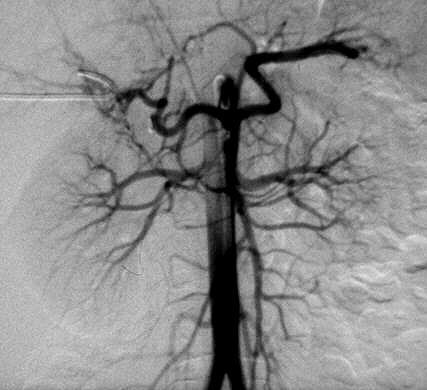 In people with severe arterial disease, the major arteries may be blocked and the contrast medium may have to be injected through a hollow needle directly into the aorta within the lower abdomen. There is a small risk of a reaction to the contrast medium. Damage to a vessel during puncture or catheterization can also occur.